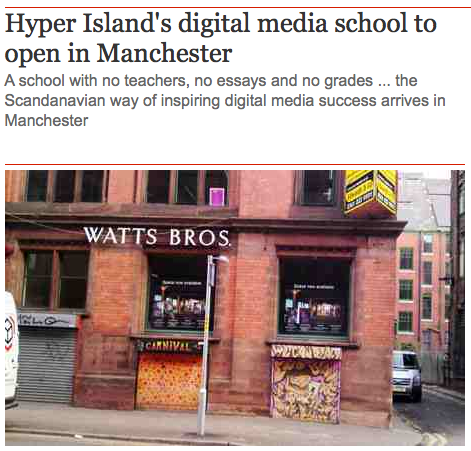 Helen Butterworth: Hyper Island in Manchester ... Yes Please ! I regularly update myself with news from Hyper Island, as I have been keen to visit the school in Sweden. This nice surprise of it locating in Manchester's Northern Quarter was a treat! The school operates a program developed by the US Military in 1960s which required leadership skills and life/death decision making. "The programme's creators realised that the leadership and communication skills were the best way to train personnel for the rapidly changing environment in which they found themselves." It sounds exciting, with 92% of graduates getting a job before they've finished school - sounds more impressive than ever as it widely recognised across the creative industry.